Biotinylated Human CA125, Fc Tag, Avi Tag (CA5-H82F4) is expressed from human 293 cells (HEK293). It contains AA Gly 12660 - Met 12923 (Accession # Q8WXI7-1). The protein has a calculated MW of 56.9 kDa. The protein migrates as 75-100 kDa under reducing (R) condition (SDS-PAGE) due to glycosylation. 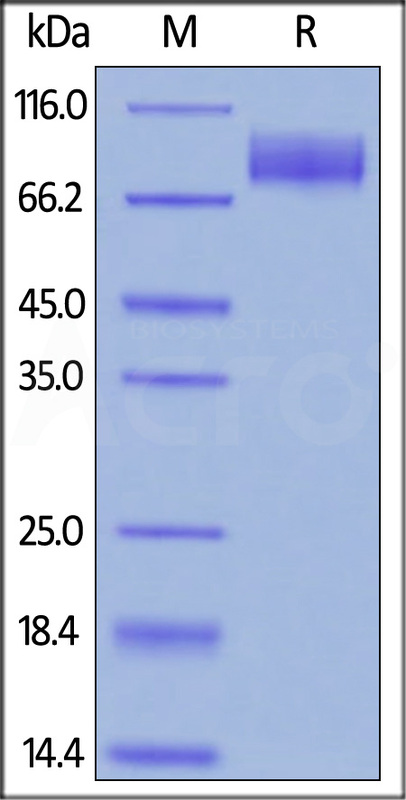 Biotinylated Human CA125, Fc Tag, Avi Tag on SDS-PAGE under reducing (R) condition. The gel was stained overnight with Coomassie Blue. The purity of the protein is greater than 95%. Immobilized Human Mesothelin, His Tag (Cat. No. 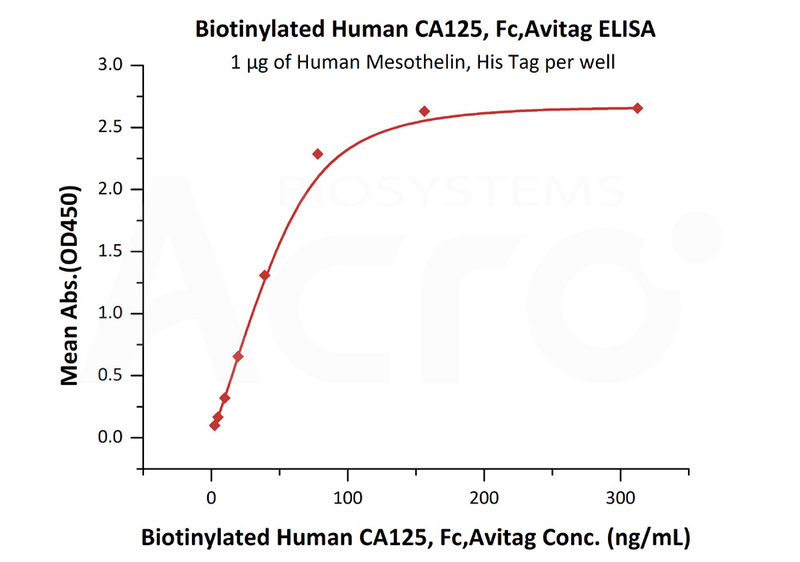 MSN-H5223) at 10 μg/mL (100 μL/well) can bind Biotinylated Human CA125, Fc Tag, Avi Tag (Cat. No. CA5-H82F4) with a linear range of 2-78 ng/mL (QC tested). The CA125, also known as the MUC16, is a mucin protein that may be found in type I transmembrane or secreted forms that are used monitor the progress of epithelial ovarian cancer therapy. The CA 125 molecule is almost certainly a glycoprotein with a predominance of O-linkages. It is heterogeneous with regard to both size and charge, most likely due to continuous deglycosylation of side chains during its life-span in bodily fluids. It exists as a very large complex (perhaps as much as 4 million daltons) under natural conditions. (1) O'Brien TJ., et al. 2002, Tumour Biol., 23(3), 154-69. (2) O'Brien TJ., et al. 1998, Int J Biol Markers., 13(4), 188-95. (3) Yin BW., et al. 2001, J Biol Chem., 276(29), 27371-5.